hidden line is still awful and I was thinking "there must be a better way..."
and it's so easy I feel like a dunce that it took me 5+ years to figure it out. 1. Have a white background and turn off grid and axes. 2. Create a white material and set the reflection to constant. Done. Instant Hidden Line that is at least 100,000x faster than the real hidden line and with MUCH better results in regards to text (i didn't do a benchmark test on this, so please don't quote me). I'm literally never using the hidden line again and i am so happy about this so i needed to share. Very nice! The only thing is Hidden Lines can be exported as vector. So, there is still a use for them. True. I think a workaround for that is to change the image options to something high-res, export image to tiff, place this image in Illustrator, and run Image Trace. Depending on the model and how much tinkering needs to be done, this would probably be faster than letting hidden line grind out a rendering for 10+ minutes. One would have to play. Been a while, but last time I did any significant auto trace work, it was quite difficult to balance getting good corners vs smooth curves. If I got the proper curves, then corners would always have to be manually cleaned up. Where this was the most obvious, was on text. Text being the technical part, may be comparable to what you would want on a CAD drawing. That being said, Auto trace may have come a long way since then. I use hidden line still quite a bit. It works fine for me. It's come a long way from older versions and it's much faster. Of course, if you have a very heavy scene, it will be slow, but I have yet to run into something that takes longer than 5 minutes to hidden line. 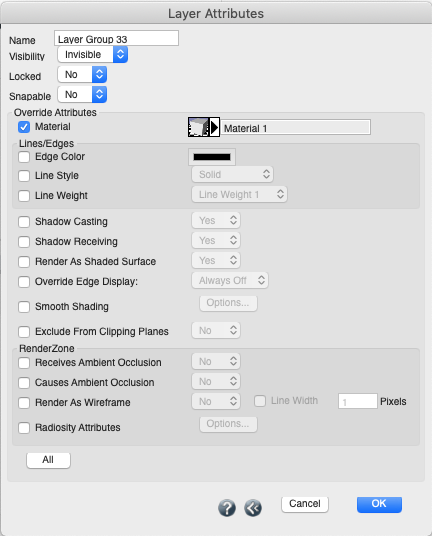 Similarly, you can place all your layers in a layer group and then be sure to select "Material" in the "Override Attributes" option. Use the white material to assign to the layer group. This method allows you to maintain the original materials while still having the option to make fake hidden line images. Agreed it is a nice quick workaround and much faster to navigate. Unfortunately the antialiasing is far superior in Hidden Line. It would be great if Hidden Line could be sped up further in v9. If indeed the sole purpose is simply a line drawing for illustration purposes this is a great workaround. You can almost get away with the settings for removing backfacing polys in the draw as well with the all white constant faces. The reason for the HL drawings from formZ is the ability to produce scale working drawings that are dimension-able and can be used by framers, dry-wallers, and other tradesmen on paper for a construction site. Until drones and robots completely eliminate humans, we still need to produce such drawings for the complexity of buildings coordinating many systems built by many tradespeople. We stopped using formZ 12 years ago for working drawings. We simply export HLs of what we need from the models and redraw the 2Ds in Vectorworks. The dedicated 2D power of Vectorworks' options from database compilation of various components such as plumbing and lighting fixtures to smart components such as wall tools, made these necessary steps in the production of the 60 page drawing sets we produce for construction of our houses and all their details. 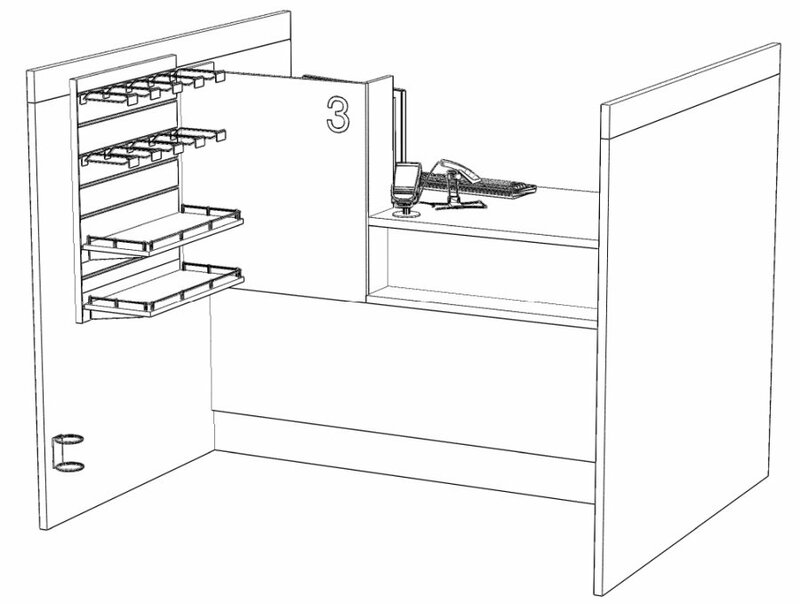 Simple imagery is all you need to produce, kudos for not needing to utilize the HL function or needing to produce complex 2-d drawings for coordinating many who work on a construction project, including those using AutoCad and various other flavors of 2D CAD. We definitively need Hidden Line rendering as we export the result as 2D drawing into Autocad. - Hidden Line produce a lot of duplicate lines that we need to erase manualy in Autocad - a nightmare! Can we expect some improvement in FZ 9? 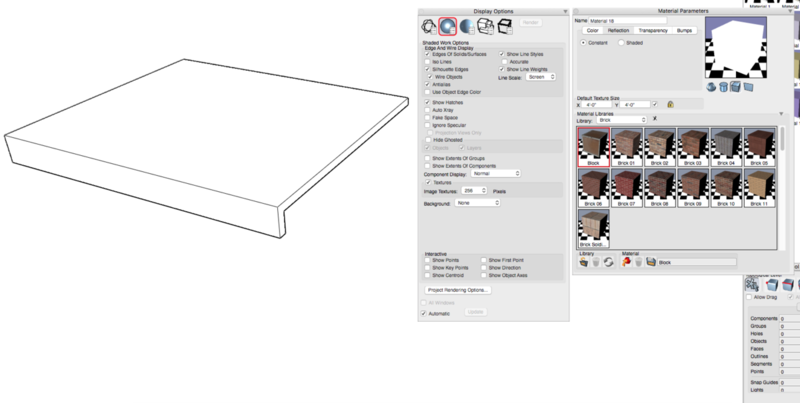 I have been using the FormZ Layout app to export hidden line to DWG. I setup a template file with plans, elevations, and sections at 1:1 scale. Once setup it is easily repeatable for multiple projects with minimal effort. So far it is working well. There is an additional step of having to go into Layout to export, but it then exports everything at once (all drawing types).